Tony Brown is releasing a new coffee table book featuring exclusive photographs and stories about his more than 40-year career as one of Nashville’s leading producers and executives. Elvis, Strait, To Jesus showcases the people who have played pivotal roles in Brown’s life, dating back to his early career playing Southern gospel music with JD Sumner and The Stamps Quartet, which lead to work with Elvis Presley, and then through Nashville’s ‘90s boom where he produced multi-platinum albums by George Strait and many others. Each person in the book was photographed in a French Renaissance chair, which belongs to Brown. Alongside photos from throughout his career, Brown and collaborators Rick Caballo and Melissa Core-Caballo, created new photographs using Brown’s chair as the backdrop. They even drove the chair to Atlanta for a photo shoot with Lyle Lovett, and to a Nashville recording studio to meet up with Strait. Also featured in the book are Lionel Richie, Vince Gill, Trisha Yearwood, Cyndi Lauper, Billy Joel, Joe Cocker, Steve Earle, Patty Loveless, Jimmy Buffett, Barbra Streisand and many more. Following Elvis’ death, Brown landed in Nashville. “I got a job pitching songs for David Briggs’ publishing company. He played electric piano for Elvis, and I played acoustic piano. Then Glen D. quit Emmylou’s tour and I auditioned and got that job. They were going on tour with John Denver for a year. I accidentally followed in Glen D.’s footsteps and it led to a lot of good things, so he is in the book. With Emmylou, I met Rodney Crowell, Rosanne Cash and Vince Gill. “When I first got in the business, Jerry Crutchfield, Tom Collins, Bob Montgomery, James Stroud, and Jimmy Bowen were producing all the records. I was the new guy in town. I kept wondering, ‘How do you get into that?’ Now I’m one of the old guards and all these new cats are guys that were pitching songs to me. Michael Knox, who produces Jason Aldean, used to pitch me all these great Warner/Chappell songs for George Strait. Jeff Stevens, who used to write all the songs, is now producing Luke Bryan. It’s interesting to see how the cycle changes. I look back on my life and I’m glad I was sitting in my chair during those golden years, when Soundscan started and everybody realized country music was selling records. Every label had about five or six multiplatinum acts. It’s just not that way anymore. My first George Strait and Wynonna Judd records sold 6 million each. The Country Music Hall of Fame and Museum will host a book signing for Elvis, Strait, to Jesus: An Iconic Producer’s Journey with Legends of Rock ‘N’ Roll, Country & Gospel Music on Thursday, May 3 at 1 p.m. in the museum’s 5th Avenue lobby. The event is free and open to the public. 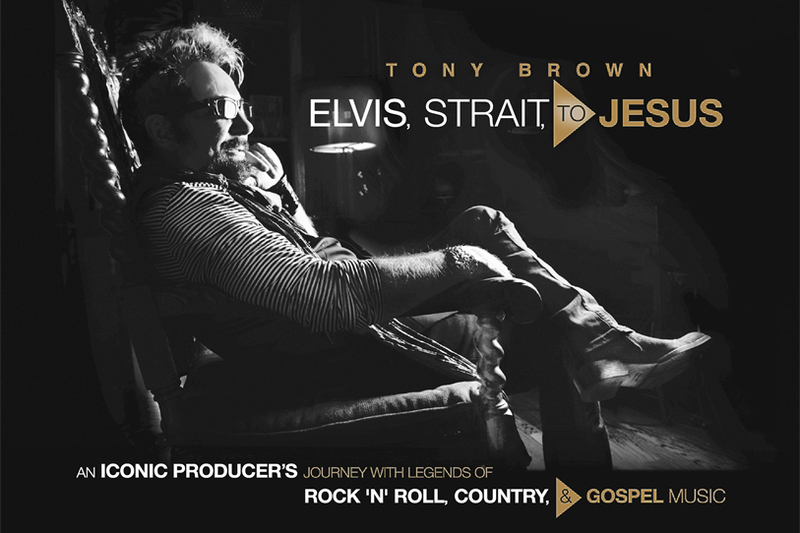 Elvis, Strait, to Jesus is published by Center Street with design and creative direction by Dead Horse Branding’s Rick Caballo. Photography by Rick and Melissa Core-Caballo is featured throughout the publication, accompanied by images from Brown’s personal archives.